Johanna Hedva will be in conversation with Asher Hartman at Skylight Books. | Poster by Mark Allen, courtesy of the artist. 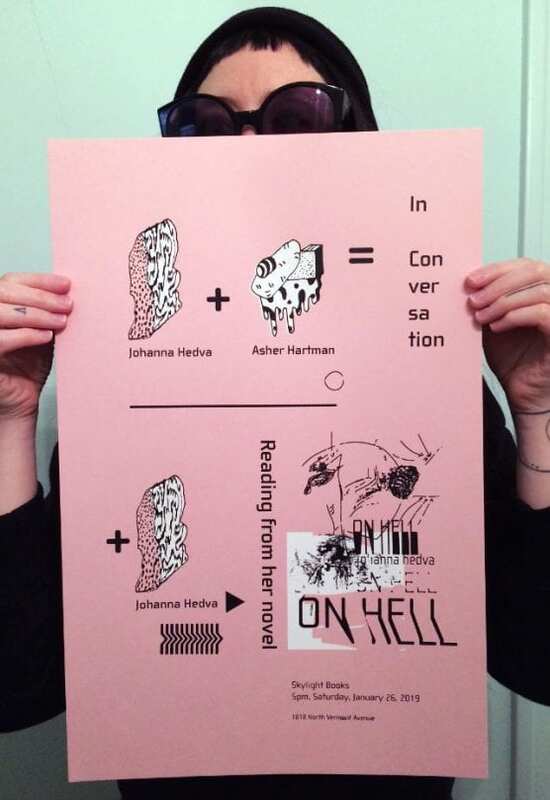 Skylight Books in Downtown Los Angeles will host author and CalArts alum Johanna Hedva (Art MFA 2013, Critical Studies MA 2014) to discuss Hedva’s 2018 book, “On Hell,” with fellow CalArtian Asher Hartman (Art MFA 03) on Saturday, Jan. 26, starting at 5 p.m.
“‘On Hell’ is my attempt at a 21st-century version of Icarus, from a crip perspective. I tried to take on Icarus’ themes of ambition, courage, failure, and gravity through the lens of ‘crip time.’ Crip time is a concept within crip theory, very saliently explicated by Taraneh Fazeli, that relates to Freeman’s chromonormativity, and is time both queered and disabled, so yes, you’re definitely aligned. “I wrote ‘On Hell’ before I started my project on disability and ableism within capitalism, ‘This Earth, Our Hospital,’ but I see the two in close dialogue, even though one is fiction and the other isn’t. Both of them are trying to deal with crip time, or time that isn’t productive, successful, or counted as valuable in a commercial market sense. When time is not regulated by capitalism, and more than that, is actively f**king up such ‘regularity,’ we have to ask different questions about meaning and value. Hedva is a genderqueer writer, artist, musician and performer whose work has been shown at the former Los Angeles-based art space Machine Project, Human Resources LA, High Desert Test Sites, the Getty’s 2013 “Pacific Standard Time,” the LA Architecture and Design Museum, and the Museum of Contemporary Art on the Moon. Their essay “Sick Woman Theory” has been translated into Spanish, Italian and is forthcoming in French and Dutch. Skylight Books is located at 1818 N. Vermont Ave., Los Angeles.